Three years ago, I imagined and created (along with several other amazing vendors) what I thought THE Blue Ridge Bride would look like. 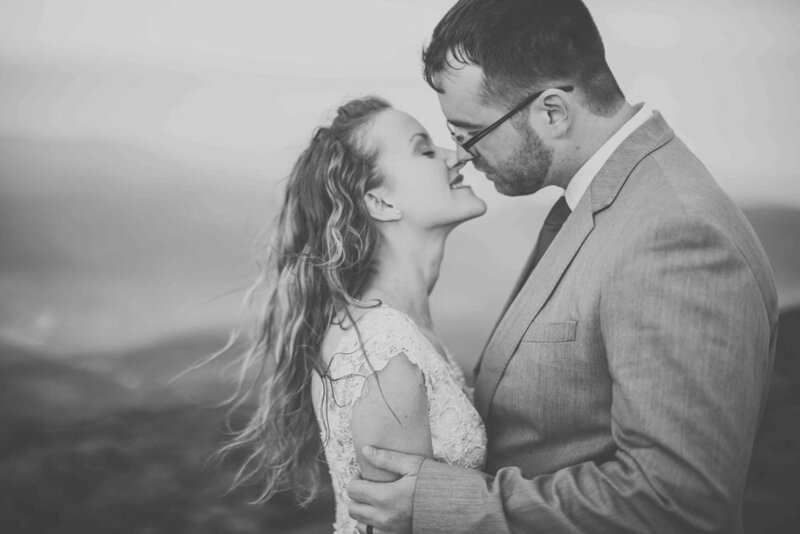 With a lace overlay dress, simple aspects and a majestic mountain backdrop... it was just a vision of mine at the time (click here to see more). 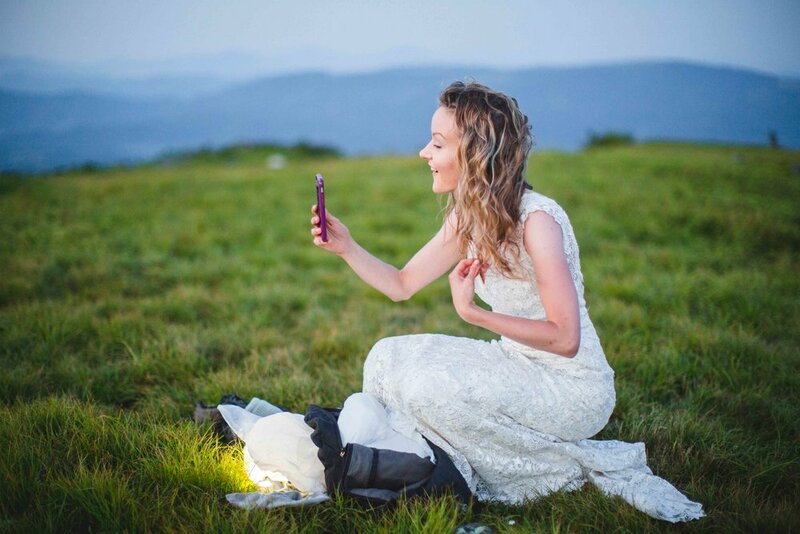 Now, three years later, my dream was someone else's actual mountain elopement! 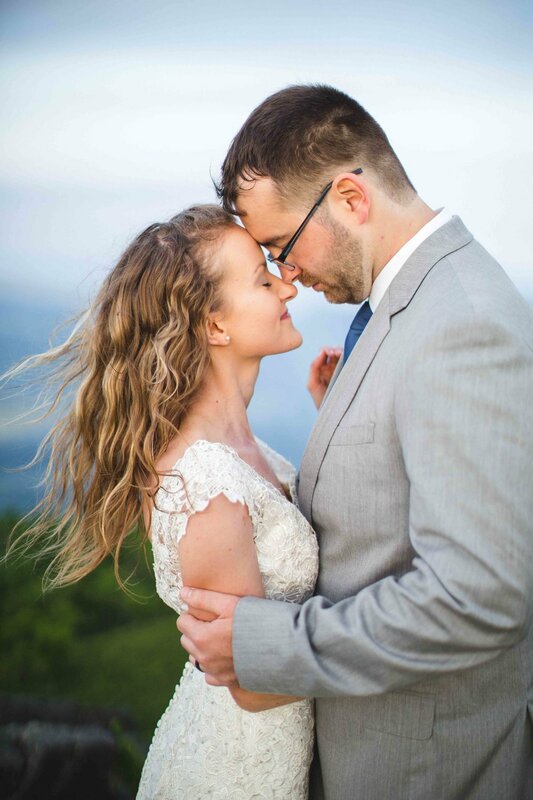 Disclaimer, I photograph all kinds of weddings at all sorts of destinations around the world, but there's just something about an Appalachian mountain range that fills my soul and puts a constant smile on my face. With a 2:30a wakeup call, a 3.5 hr drive and a 20 minute hike to our location, Zack & I arrived in our cars to find Kelly already at the parking lot. She had stayed the night beforehand & had jitters upon our arrival. 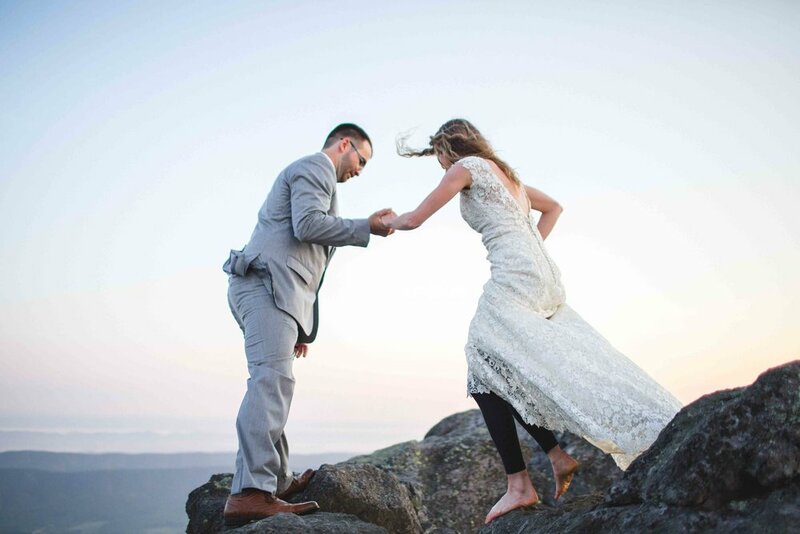 Zack & Kelly wanted to wait to see each other until sunrise so I hiked up with Kelly first as she carried her dress in a trash bag to the top, slipped it on over her leggings and waited patiently while Zack got dressed in the woods nearby. Escorted by their pup on the way eye, Zack made his way towards us at sunrise. 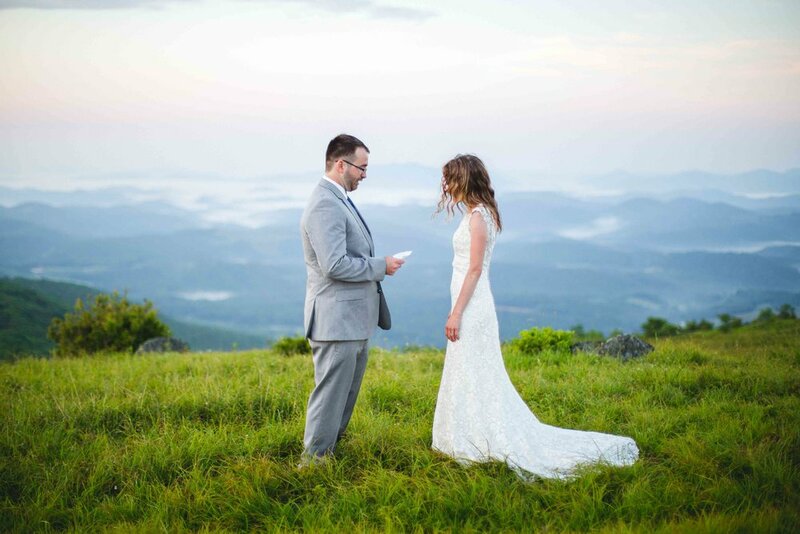 Although their day was not super traditional, they said their personal vows, exchanged rings & shared their first kiss while the fog settled on top of the mountain range. It was perfection & yes, I teared up. From there, we devoured every inch of that pink light that we could and boy was it worth the wake-up call. I can't quite remember when Kelly mentioned it or the exact words, but I have to give her all the credit for one word that describes my style perfectly. Magnetic. She is an avid hiker and described the mountains as having a magnetic pull. There's something about them that you just can't get away from them. After hours of exploring, we finished their elopement off with a hike back to the cars where they set up a picnic for the two of them & their sweet pup to celebrate. 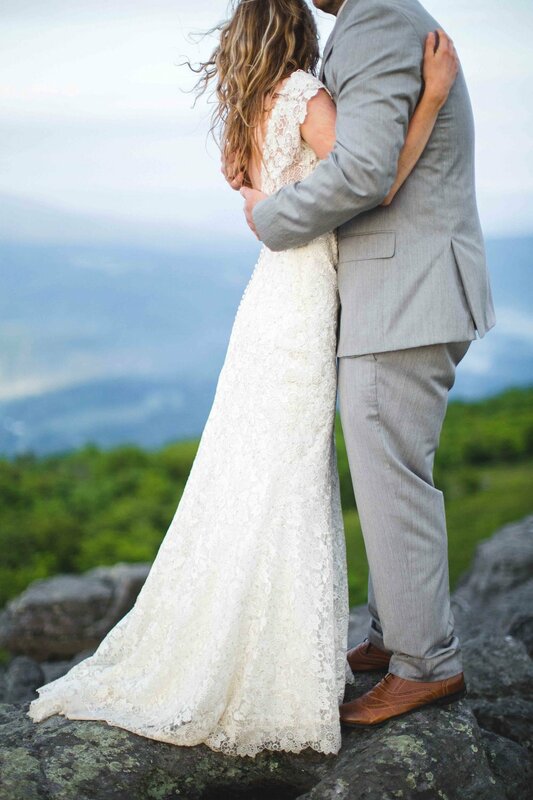 In 2015, it was named the Blue Ridge Bride because it hadn't been created yet and because of their gorgeous view. However, that title has since become popular in my area and I want to stand out. Therefore, we've spiced things up a bit and have now created something similar yet simpler. 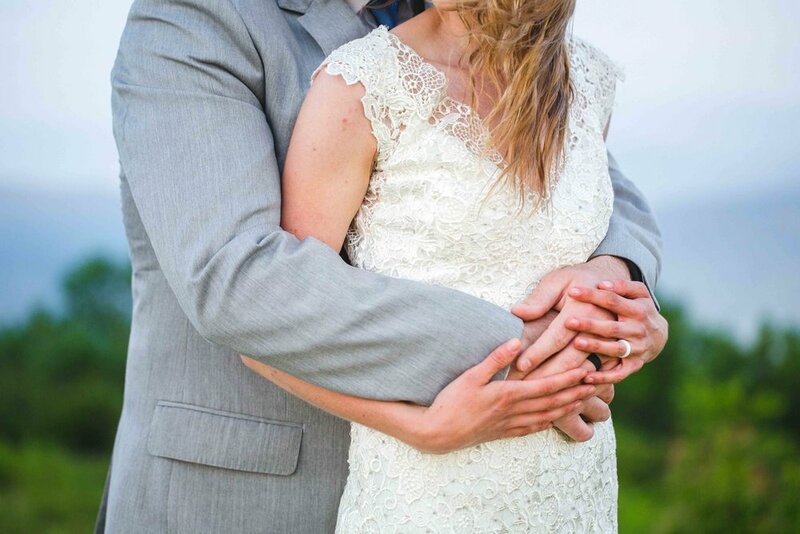 Unthinkable and magnetic, I give you... the Appalachian Bride!